Check Sewer Lines before they break! During the spring and summer, there is typically a lot of rain. This is great for your garden, but not great for your sewer lines. Many homes and businesses, especially the older ones so common in this area, have old sewer lines that are cracked. During the spring, the additional rain can seep into these cracks and cause major issues for your sewer line. Tree roots can also grow into a sewer line and clog it. Those trees just LOVE all the sewage and can grow fast. You can save yourself a lot of trouble by having your sewer line checked every spring for potential issues. 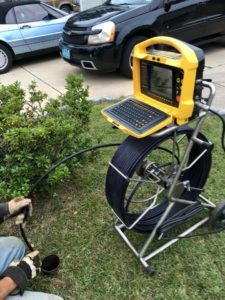 Having your sewer line scoped to see if there are any issues is one of the most important things we can do as homeowners. Repairing a section of sewer or a crack before a sewer line completely breaks and raw sewage backs up into your house can save you the headache of a sewer line emergency. Contact us today! We have a special camera (pictured below) that we can send down to scope your sewer lines and show you if there are any cracks or leaks. You will see with your own eyes, and not have to guess what the issue is! Our Camera Scope that we can send through pipes and sewer lines.